This is to alert you to “Support for Life” in Sydney, but I will be in Melbourne this Thursday, 10 March, so have included details of that also. Some of you will know that I have worked with Breast Cancer Network Australia for a decade now, both as an ambassador for that wonderful organisation and also giving wellbeing presentations at their many national forums. While continuing my work with BCNA (Wagga Wagga and Sunshine Coast coming up soon) I am also about to work for the first time with Petrea King’s Quest for Life Foundation. Through Quest, I will lead a group over six evenings, starting Monday 11 April, for women and men who have had a life-changing diagnosis or illness. The goal is to increase a sense of personal choice and empowerment, perhaps even greater joy in living, no matter what each participant’s prognosis. This is a real opportunity for sustained support so do please contact Quest if it’s something for you, or share these details with anyone in your circles who may benefit. Booking details below. You may want to read my latest article, “After the diagnosis”, currently on the front page of my website. 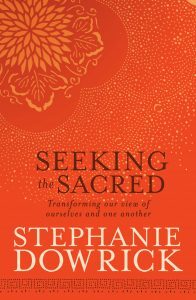 Also a reminder that I will be in Melbourne this Thursday, 10 March, 5.30 for 6pm, at Dymock’s Melbourne, 234 Collins Street, to talk about Seeking the Sacred, how this book can enlarge and uplift our view of life, as well as taking a little time to talk about the writing of it and its reception. This event if FREE but phone to book: 03 9660 8500. I will literally be in Melbourne for the few hours this event will involve so would especially love to see some of you there! “Support for Life” in Sydney will run over six evenings from 11 April, with a break for Easter Monday, from 6.30-8.30pm. The location is Crow’s Nest, Sydney. A partner or support person may also participate. Group numbers are limited to 22 so early booking is required. Cost $395/$295 concession includes tea, coffee, notes. This is a group for women and men. The emphasis is on support and skill-sharing that will be of benefit to participants whatever their stage of life or prognosis.